10¾" (27.5 cm) foot circumference and about 10¾" (27.5 cm) long. 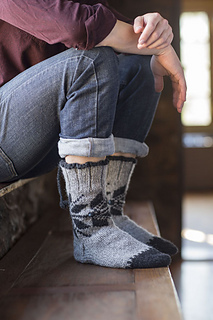 Härmä, which means “frost” in Finnish, is a very fitting name for these lovely, thick and cozy socks as they are exactly what you want on your feet first thing on a chilly frosty morning. These socks are great for padding around the house and for wearing when warming your toes in front of an open fire. 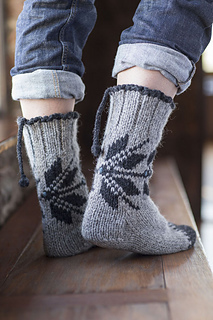 Knitted from the top down using five double-pointed needles, the Härmä Socks have a traditional decorative cast-on, a deep rib, a typical half Nordic star pattern, a turned heel, shaped gusset, and classic toe shaping. Traditionally, the best mittens, gloves, and socks were adorned with a tassel. Sometimes the tassels would be made at the end of the fingers or the toe of a sock, which were of course slightly impractical but naturally symbolized that these were not for everyday wear but for special occasions and celebrations. 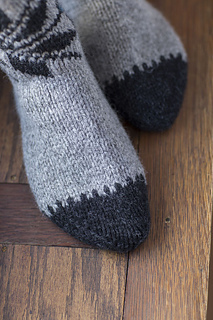 The Härmä Socks are knitted in a chunky pure Shetland wool and once completed they are washed in warm soapy water and left to dry flat. Set of 5 size U.S. 9 (5.5 mm) double-pointed (dpn). Adjust needle size if necessary to obtain the correct gauge. Markers (m); waste yarn; tapestry needle.